Stefan is a Technical and Research Assistant and joined the Centre for Wood Science and Technology at Edinburgh Napier University in 2006. 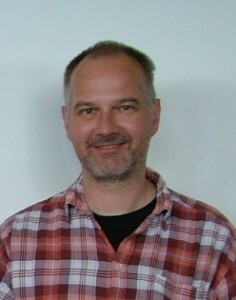 He graduated from the University of Hamburg in 2001 with a diploma in Wood Science and Technology. As part of his degree he investigated the wood properties of various taxodiaceae. Prior to Stefan’s involvement in wood research he worked for the construction industry being responsible for cost controlling and administration on construction sites as well as in timber trade. His current role is the technical implementation of destructive and non-destructive testing, wood processing, supervision and monitoring of laboratory activities and field work regarding forest research. He has been involved in numerous projects concerning timber grading, wood properties and forest management. Stefan has a particular interest in wood identification which was part of his university degree.